Pre-animate! 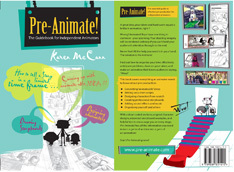 A Guidebook for Independent Animators. This 200-page full-colour book will be published in June 2006. PreAnimate was inspired by the students in my animation course at the City University of Hong Kong's School of Creative Media. The illustrations and design of Pre-Animate were a team effort by Tony Wong, Julius Wong and XO Hung. Tony was primarily responsible for the design and also contributed illustrations; Julius worked on illustrations and photography and he also co-taught my classes at the School of Creative Media; Ah-Hung designed the original characters, drew the storyboards and contributed other illustrations for the book. The book was partially funded by the School of Creative Media. 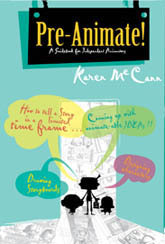 With colour-coded sections so readers can jump in wherever they want, original characters and storyboards to illustrate key concepts, and helpful tips to encourage at every stage, ‘Pre-animate!’ has all the information needed to turn a germ of an idea into a gem of animation. 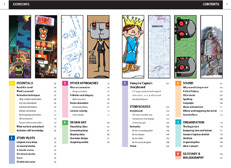 Click here for a larger view of the contents pages.